– Sold game ball on eBay. – Went through New Era Field’s Lost & Found bins and grabbed sunglasses for his kids. – After stadium emptied joined GM Brandon Beane at midfield doing donuts in team’s medical cart. – Borrowed Terry Pegula’s private jet to fly to California to toss Timbits at Al Michael’s front window. – Joined Terry Pegula in team’s Concussion Protocol tent for an all night poker party. – Hung out on his roof dressed in a loin cloth gnawing on the skull of a wolverine. – Attended a kegger at the Celery character’s house. 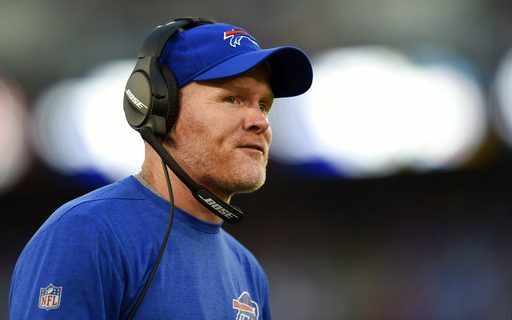 – Used his clout as an undefeated coach to talk Terry Pegula into having Kevin O’Connell stand in for him the rest of the year on the Sean McDermott Show. – Hung out at the Big Tree Inn wrestling people for beers.